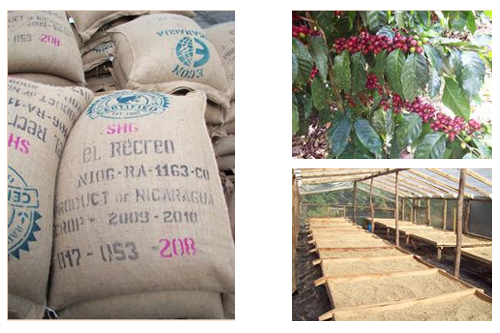 Here at Woodshed Roasting Company we are very excited to enter into a Direct buy with El Recreo Estates, Nicaragua. This has been a family owned farm for over 30 years. El Recreo Estates not only grows high quality Specialty coffee but they do it with social responsibility to their workers and community. They are a Rain Forest Alliance grower which means sustainability is very important to them. We only purchase the finest quality specialty coffee available from around the world, the coffee from El Recreo Estates meets this standard. For these reasons Woodshed Roasting Company is pleased to enter into a long lasting Direct buy relationship with El Recreo Estates. Either individuals enjoying a relaxing and tasteful time, family sharing memories or friends having fun, a cup of coffee brings them together. They want to provide relaxation and unity through a high quality coffee rich in flavor and taste, grown under right environmental conditions with social responsibility. Their mission is to provide means of relaxation and unity through a high quality coffee rich in flavor and taste grown under right environmental conditions with social responsibility. This is a coffee company that has a social commitment to their workers and the local community. Currently, they provide permanent lodging for twenty families and two hundred seasonal workers. Their social commitment provides education, health care, recreational activities, and a nutritional diet to their workers and their families. Throughout the year, the School of Technical Training open its doors to engineers, technicians and minor proctors to educate and train in technology, farm agricultural techniques, administration, and others. The school offer advance courses, short courses and seminars to improve knowledge and capacitate in the field. The best use of resources is a goal, and knowledgeable team effort and work habits are the way to produce high quality coffee. The School for Kids takes care of the children of the 20 permanent families in the farm. At the school, they learn about writing, reading, math, social skills, and others. There is a sense of community and respect that help these children get a loving educational environment. The friendly personnel make of the school a ‘must go’ place for education and friendships. At the Health Center, doctors and nurses take care of workers and their families’ health. They make sure patients have the right treatments when needed. They also teach about the importance of a nutritional diet. The pharmacy provides medications for an immediate quality attention. Safety of the workers and their families is important, and at the Health Center, this is a priority. El Recreo Estate Coffee high quality originates from the high altitude and favorable climate conditions of the farm, El Recreo Estate. At an altitude of 1,200 meters above sea level, in the coffee region of Jinotega, Nicaragua, El Recreo Estate farm is located in an optimal coffee growing environment. Their natural methodology for coffee production follows the standards detailed by the Rainforest Alliance and ensures our coffee is of the highest quality. The back bone of a high quality coffee is its growing farm. Read more about El Recreo Estate Farm here.